Does your pet get hurt by your current pet door? 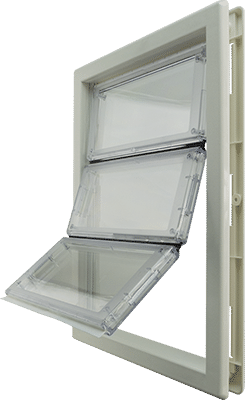 With the Air Seal Pet Door innovative design, this door keeps your pet safe and unharmed while having the maximum energy efficient and wind resistant dual pane LEXAN® hard panels. Medium 1-1/4" to 1-3/4" 6-5/8" x 11-1/4" 8-1/2" x 13-1/4" 13 to 35 Lbs. Extra Large 1-1/4" to 1-3/4" 10-1/4" x 15-3/4" 12-1/4 x 17-1/8" 36 to 90 Lbs.